The program uses some sets of free icons taken from sites famfamfam.com, yusukekamiyamane.com and fatcow.com. Many thanks to the authors of those sites. 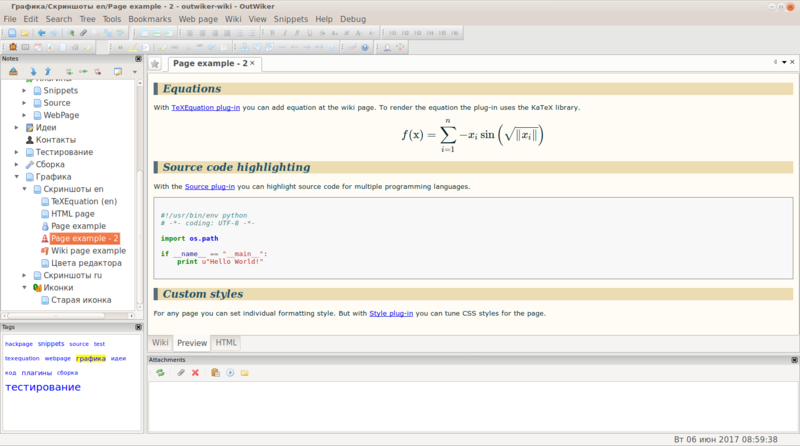 OutWiker distributed with source code under the GPL 3.
outwiker_2.0.0_win.7z (7z archive, 20 МБ). 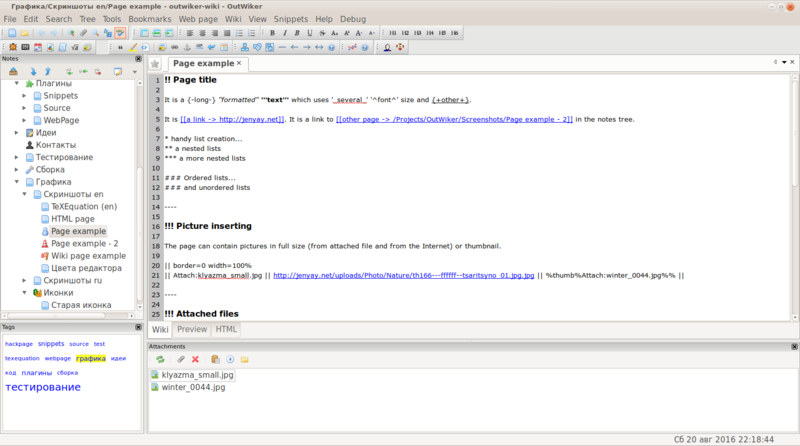 outwiker_2.0.0_win.zip (zip archive, 26 МБ). 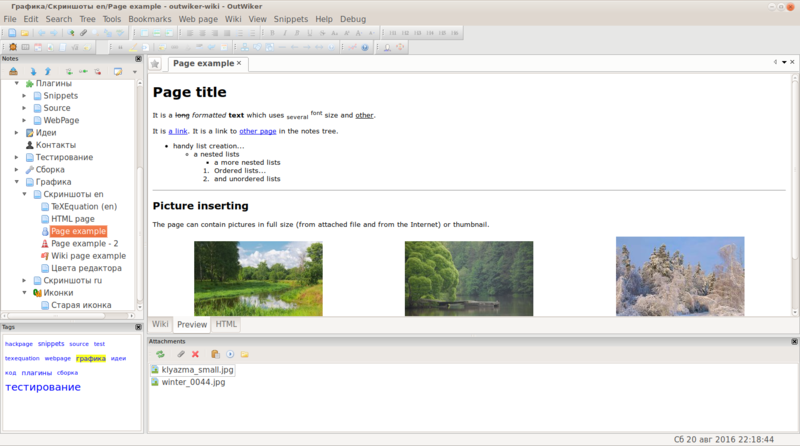 outwiker_2.0.0_win_all_plugins.zip (archive 7z, 33 МБ). 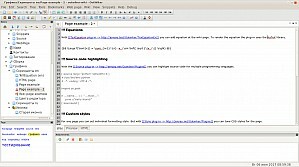 outwiker_2.0.0_win_all_plugins.7z (archive 7z, 25 МБ). The base is stored as a directory tree on disk. Any number of files can be attached to each note. Pages can be of different types. 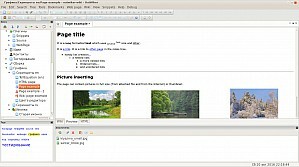 Attached images can be inserted into the HTML-page. Each tree branch can be opened as a separate wiki. Portability. Program all the settings can be stored in its directory. The ability to create links between pages. Global search on your notes and search by tags. Batch job with the tags. May it be better to make the program keep notes in one file? Keeping notes in a tree - the main feature, for which the program was developed. This does not mean that someday I will not add the option for choosing ways of storing your notes, but this will not happen in the near future. Will there be a visual editor for the pages? 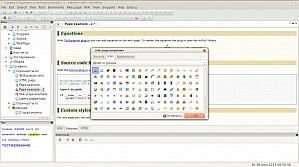 There are some thoughts to make a separate page type format RichTextFormat with the visual editor. Please do not exclude the possibility that there will be a visual editor for HTML-pages. But still I can't talk about dates. If you use OutWiker in the portable mode then to install the plug-ins need to unzip the downloaded archive to plugins folder close to the executable. If you use OutWiker in the usual mode then select "Help - Open Plugins Folder" menu item. After that will be open folder for plugins. Take note what each plugin is a folder with the files. This plugin folder need to copy in the folder with plugins. In the preferences dialog (Edit - Preferences - Plugins) can disable plugins without remove their files from plugins folder. 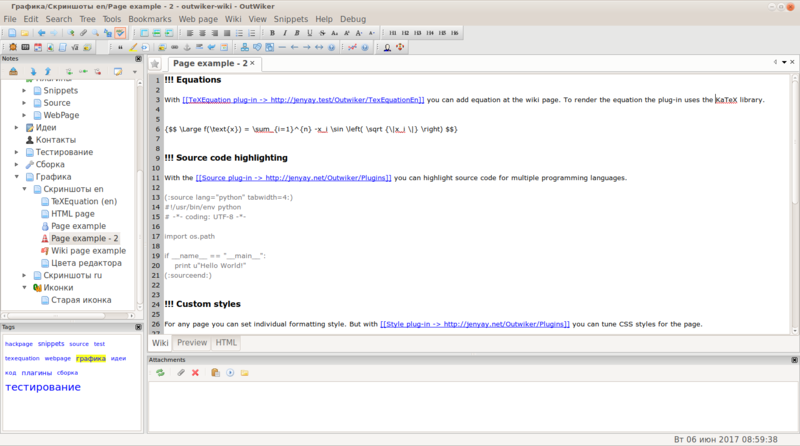 Source code of OutWiker is free. The program now uses wxPython 3.0 library. 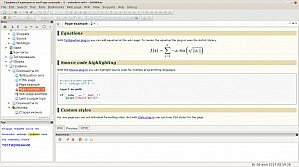 The editor adds the ability to duplicate the current line with hot key or menu item. 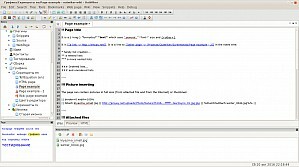 The editor adds the ability to delete the current line with hot key or menu item. The editor adds the ability to move lines up / down with hot keys or menu items. The editor adds the ability to join lines with the hot key or menu item. 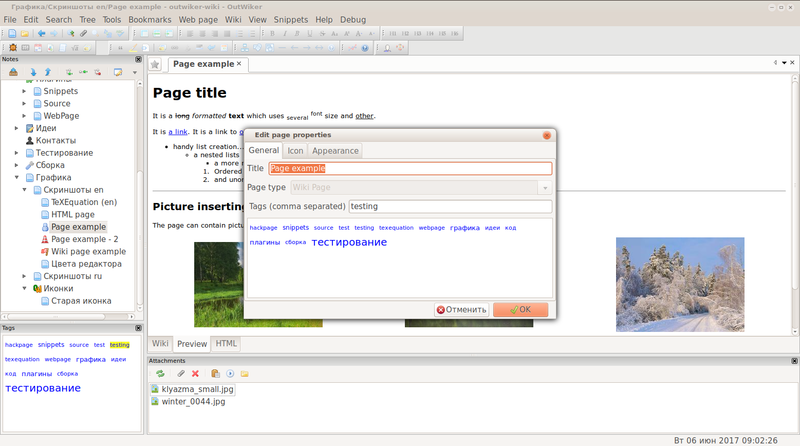 The editor adds the ability to remove word to beginning / ending with the hot key or menu item. 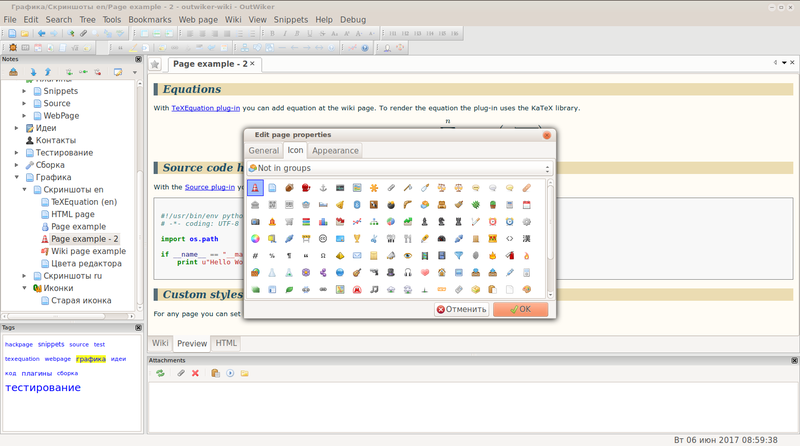 The editor adds the ability to decreade nesting level of the list items with the hot key or menu item. Added the menu items to move cursor in text. Added the menu items to copy / cut the current line to clipboard. Added the "--page, -p" command line parameter to select page when starting. Added the "--normal" command line parameter to disable minimizing when starting. Added the "--debug" command line parameter to run in the debug mode. Restored availability the icon in the system tray on Linux. Added the ability to add alias to page. Changed GUI to set hot keys. Added options to change editor margin color. Added options to change background color of the selected text. Hey, thanks for a great program! Just wonder if there's possible to change default char set in HTML-mode from 'CHARSET=UTF-8' to 'CHARSET=iso-8859-1'. I'm writing in Norwegian, meaning I use special characters (æøå). These don't show in UTF-8. Easy to change the encoding to iso-8859-1 does not succeed, but I think that can be done. Unicode is not really in these characters? 2. If i just open the .html-file from Outwiki's filesystem the browser gets it right! - Well, I guess theres no big problem here! 3) open a page and link on a split frame or a separate window. I like the spoiler plugin. If those lines and borders of the spoiler can be removed, the page would look cleaner. It says version 1.7 can open notes in separate tabs. I found that only note links can be opened on separate tabs by right-clck context menu. Can those notes on the tree do the same way? My OS is windows xp sp3. Thanks! Thanks for the suggestions, I'll add them to the ToDo list. In spoiler plugin I'm going to make the ability to customize style elements. To open the page in a separate tab, you can first create a new tab with Ctrl + T, and then select the desired page. Or when you click on the page in the tree to keep pressing Ctrl. Your method on opening pages on new tabs works very well. Thanks! Hope outwiker grow successfully! 1. on create new page have as default a title "New page" with auto increase(or even without) just to speed up the page creation a little. Anyway even without these....this is one GREAT Application!!! 2. This is already in the plans. Really usefull program, easy to understand. Nice features (storing attachments, thumbail and childlist-command are great). Nice alternatives for TheGuide and even Treepad!! I personally find really awesome this application. I don't use wiki, but I can insert simple html content in the application and if I want add more sophisticated tags, it's immediate to open the page in external apps. Anyway I feel the missing of the head section. All these functions could be applied simply allowing a template for the head section added in the content.html. Of course I could change it, but if I change page.text, the modification is reflected into the final content, while head section is hard-coded. Please, add this feature asap!! Ok. I will add this reauest in the ToDo list. Hi, I think that internal links to other tree elements should work also opening html with browser. Maybe the preview was designed per-page, not per-project. Your web pages does not mention if the version of the program is in English. I could really use this to organize my Linux notes, but I only read English. Is an English version possible? Thank you. Yes, English language is supported. could you add support for BibTex bibliography and exporting whole wiki to HTML easy browsable via webbrowser (without outwiker)? You can use plugin Export2HTML - http://jenyay.net/Outwiker/Export2HtmlPlugin for export to HTML. As for BibTex, I add task in ToDo but I can not promise that I will do soon. Is it possible to do bigger block of monospaced-texts? And for code can to use plugin Source. Works very good, even ocaml is supported (exacly what I need). I had to tell that Outwiker seems to be very very good software. Big thanks. What do you think about removing root from wiki outline? I can have only one wiki open in window. In my humble opinion hiding root could improve readability. Could you add shortcuts for navigation? Standard keys works on outline until I open page which is in Wiki mode. Then focus is captured by editor and I cannot continue navigation. > What do you think about removing root from wiki outline? I can have only one wiki open in window. In my humble opinion hiding root could improve readability. Root shows to be seen what the wiki is open now. > Could you add shortcuts for navigation? Standard keys works on outline until I open page which is in Wiki mode. Then focus is captured by editor and I cannot continue navigation. > Root shows to be seen what the wiki is open now. I think that it would be more clear to have current wiki name inside some label above wiki's outline tree. > Buttons back / forward? But I am not sure if would use them all when you will add them :-). Most of required functionality can be achieved by keyboard when focus is on the wiki's outline tree. Maybe some key to give focus on this outline would be enough? Then you could just add some shortcuts for collapsing and expanding [space does something else] on outline. I accidentally removed Wiki page. Can it be restored? If not, could you extend UNDO to support this? Currently this is not possible. In the future I am going to make a recycle bin. Do you plan to add an option to keep the attached files in their original folders, instead of copying them? That would be a great functionality. Thanks for the idea. Have not yet thought about it. The stable version is slow. 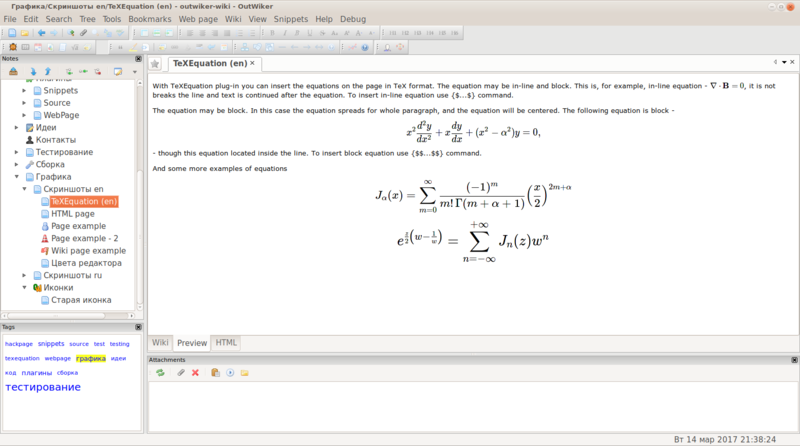 I am doing notes from an on-line course, and after 487 lines typing new text is slow. When typing I can see that typed character is formatted with delay. Does version 1.8.1 work with Windows 8.1? Now what about folding, to easily display the main structure of any document? I miss that so much. Wrap/Nowrap lines would be another small nifty feature, I believe. How to set global style? How do I change default style to AVC? RE: How to set global style? At present time OutWiker can't change default style but after creation of the page with any style, this style will be selected default. I have been using the program and think it is great! Thanks. Is there an easy way to import an existing directory tree? The page titles are the names of the existing directories. Each folder contains files to be attached to the Wiki page. There also are pdf files which would be linked to the wiki page. It would be great if I could re-use the content of a note in another note. I know developing a powerful search indexer is a full project on its own, but there are already numerous interesting titles out there that could be used as a plugin or addon. A few that come to mind is DTSearch and Apache Lucene. In addition, to make a full use of the search engine, a powerful internal file viewer like Oracle Outside In would come handy in order to display search hit results inside of documents (PDF, DOCX, XLSX, RTF, HTML, etc.). 2) Convenient tagging - something similar to Evernote or TagSpaces. This would allow to quickly group notes/files/folder by urgency/subject/time etc. Hi, is there any chance to get specific nodes password-protected in the future? It is possible. Now You can use VeraCrypt or encfs for encryption whole notes tree. Is there any plan for support wxPython 3.0 ? Can you please add sortable tables. I tested http://www.kryogenix.org/code/browser/sorttable/ and works good :). > Is there any plan for support wxPython 3.0 ? Yes, I plan go to wxPython 3.0 after release Outwiker 1.9. Ok. I added this to ToDo list. I like OutWiker, and am trying to use the html on my iPhone, using an app called Html Reader. Some .html pages show great, others show only Attachment and Child Pages (and this is true even in a browser on the computer). Can tell me why, and how to predict what kind of webpage copied in to OutWiker is going to be unreadable this way? Is there a collapse all shortcut key? I think it would be good if we can collapse all expanded branches in one click or using shortcut. I have tried this application, and I quite like it. There is however a tiny issue preventing me from using this to keep track of my notes as my own personal mini wiki. Looking at the saved file structure it appears that the icon is saved in the nodes folder (__icon.png), and when I create blank pages (for structure purposes) they seem to create some content files that are identical to other blank pages. This for most will not be an issue, but I frequently run duplicate checks on my computer as I have in the past been known to accumulate too many files. As the __icon.png files seem to be the same, and blank files seem to be the same, they will flag as duplicate files and cause some problems. Usually I zip files together to avoid this, however for a constantly changing, constantly accessed program, this is not really an option. Maybe if I get a chance to improve my python skills I can implement some changes to fix these small issues. Overall it is a nice program, and for most users the tiny issue I mentioned will not be of any concern. So many thanks for the time and effort that has gone in to creating it. On a side note to WS, I also have seen the "Attachment and Child Pages" issue. But for me it only appears on blank pages. Recently Ubuntu 16.10 was released and after upgrade, the Outwiker fails to start. Is there a quick and easy way to fix it? Thanks for the report. Is the python-webkit-dev package installed? I will update Ubuntu in the coming days.I will try to fix everything quickly. Yes, the "python-webkit-dev" (1.1.8-3.1) package is installed. To fix this problem install python-wxgtk-webview3.0 package. Today I uploaded a new build to PPA with fixed problem with Ubuntu 16.10. Hello, is it possible to change th font size (color) on the outline tree panel? I want to add ability to change the color and font in the notes tree in a future version 2.1. I downloaded 1.9 today and I'm very impressed. I have it running in Win7 Pro 64bit. The minimize button closes the program. Also, I tried several ways to have it resize images from a URL including copying the code exactly from your help page. They simply show in their original size. I am able to resize them if I attach a local file. I'm creating a help index for Simtropolis.com where I'm a Moderator. We want all the images shown to come from those already posted on the web. 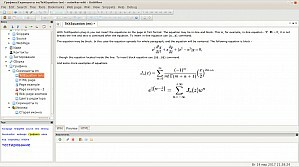 You can see examples in my post: http://community.simtropolis.com/forums/topic/72646-rednotebook-sc4-linkys-idea/?do=findComment&comment=1660218 and the test data is attached in a zip. Ok, so a couple other peeps corrected me on my statement that minimizing closes the program. It actually gets placed in my hidden icons part of the tray. Is it possible to make it minimize to the task bar like other Windows programs? Randy pointed out that I could change the minimize behavior by unchecking the Minimize to tray. That now makes it go to my task bar like I want. For some reason tho when bringing it back it forgets that I had it full screen. So, the only thing holding us back from adopting this as our program of choice is we would like the resizing of a URL picture to work from the code entered in the Wiki tab. I hope this is something you can work on cause everything else about your program is hands down the best one we've found. This is the writing app I've been looking for forever. Tried Zim, Tiddlywiki, the usual suspects of Scrivener etc., but this does it all cleanly, easily, and markup-ly. Plus open source = and Linux+Windows-friendly = . Love the ability to toggle between preview and HTML. Keep up the good work! assume i have more than 1120 text content under different heading. each text content will be of 100 kb each. If i had sub nodes for each one and paste the content and do a search. will it return the results of a word less than a second. Did the outwiker index the words inside the contents? Is type search like in google and show the results with "NEXT" and "Previous" is available. With a lot of big notes, the search will be long. How long - it is necessary to measure. At the moment, no indexing is performed for the search. Hi, I have tested tens of outliner Windows software and Andoid, most I do not use. But on Windows I regularly use several like: Wikidpad, Scrivener, Rightnote, Whizfolders, CherryTree, Subnote (with left panel), Atom (with left panel), LightTable, Small Editor. There are things that stops me using outwiker. But I want to. 1) One of the main points of any outliner is to quickly go down the left pane by arrow-down key and see contents in right panel. The others I mentioned do this except one which needs a plugin for focus. Outwiker changes focus to right panel so keeping arrow-down key does not qucikly show contents of nodes in right pane. This needs to be the default. 2) Also when clicking on items in left pane, the tool-bars at top change according to content type in right pane. This slows down the content display and also flickers. A solution might be a menu option in View + Shortcut to show/hide all selected too-bars. Then after finishing quickly browsing, shortcut shows selected tool-bars again and it shows appropriate tool-bars for that content type. If you try the softwares I mentioned with a big sample file, you will see just keeping arrow-down/up goes through content nodes fast and the data in the outliner can be seen very fast. Or maybe set a GLOBAL Too-bar configuration so it does not change according to data type. This is really a must feature for any outliner. You have done the hard work and it allows so many data types, more than the other softwares, and you just need to make sure the focus stays in the left pane and the flickering tool-bars don't slow down & flicker screen. correction: Subnote (with left panel), I meant Sublime Text Editor 3 (with left panel) and before v.2, which I use for coding. But now I am using Atom editor more and more for code. There are plugins for both Sublime and Atom to keep focus on left pane for fast browsing of files/folders. I use black theme (not just dark) for everything even windows (incl. black folders etc) with custom themes whcih modify shell etc. Ans also android black themes for Android by Substratum app. Black theme is easy on the eye, saves battery, no flicker etc. I set up Outwiker to have black backgrounds on left & right panes with gray fonts. It would be nice if there is a custom Black (or just Dark) theme by you in future versions. Many Windows & Android apps offer Dark and/or Black themes now. Also keeps the overall look, icons toolbars etc, mindful of how they work with Black/Dark look.